Come on out to Timber Park and be one of the first people in the world to throw new molds from Latitude 64, Westside Discs, and Dynamic Discs. We will be playing a competitive round in the morning in which you can only use the discs in your player's pack. Awards will be given to the best men's, women',s and junior's scores. We are also working on adding some side games and a clinic to the schedule. More to come soon! Player's packs will be available for pick-up from 9am - 5pm on June 15, 2019, at Timber Park. 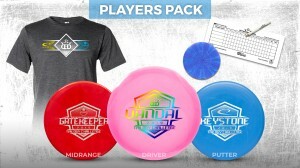 I will also deliver players packs to local Portland disc golf events the two weeks following the Trilogy Challenge for those of you not able to attend the event. Are you interested in purchasing more than one player's pack? If so, please message me after you register for the event and I will provide further directions. Refunds will be given up to 8pm on May 30, 2019. I apologize for not being able to extend this deadline, but I have to order player packs two weeks in advance of the event.